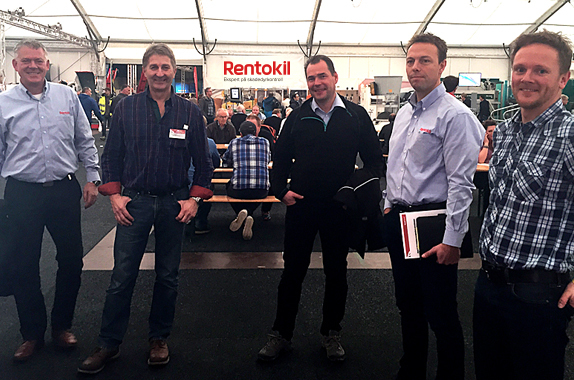 From the left: Arne Nese, Technical Manager of Rentokil. Almar Markussen, chairman of HeatWork. Torstein Bergli and Stein-Birger Østmo, publicly approved exterminator and sales consultant, Rentokil. Tommy Larsen, head of sales, HeatWork. For several months, HeatWork has worked closely with Rentokil, and this week it was finally decided. A collaboration for the use of environmentally effective and approved methods involving heat treatment, in the fight against pests. “This is something we are proud of. To enter into cooperation with one of the world’s largest pest-extermination companies, Rentokil, will strengthen our approach to the future. By using fluid-borne heat to combat pests, one reaches high temperatures quickly, just as one takes care of health, environment, and safety concerns,” says a satisfied Almar Markussen from HeatWork. Rentokil uses HeatWork’s effective system for heating pest-infested areas, such as apartments, hotel rooms, and more. The heat kills the pests, from larvae to fully mature adult individuals, and is a completely non-toxic method. The method stands out because one conserves the environment in an entirely new way, both with regards to unnecessary emissions from aggregates and unfortunate chemicals found in insect-toxic formulas. In addition, this method does not burn health-damaging dust and particles. Rentokil is a global actor with over 70,000 employees and has more than 40 years of experience with pest control in Norway. The company covers all of Norway and their goal is to operate in a safe and serious fashion. The HeatWork system is operated by Rentokil’s own and approved exterminators with special education in heat treatment. HeatWork’s strong focus on taking care of health, the environment and safety renders the system very attractive to the market. Rentokil has chosen to use the HeatWork system precisely because the company is concerned with Health, Safety, and Environment – as well as with the use of environmentally correct options. HeatWork’s self-driven and mobile machines operating at 103 kW deliver 100°C of fluid-borne heat with an effectivity of 94%. Together with the new CliWi, a unique fluid-borne exchange technology – fluid to air, this comprises an innovative system for pest control and extermination. The system delivers an effective air temperature of up to 90°C, and is an effective and environmentally-friendly alternative to using poison and electrical methods.